What is better than pancakes on the weekend? Pretty much nothing! This is my favourite pancake recipe - it is filled with fiber from the oats and whole wheat flour, but still has a ton of flavour! 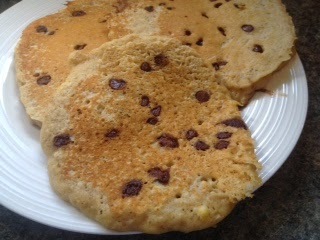 Plus the chocolate chips get all soft and gooey! 1. In a large bowl add the milk and oats and let sit for 5 minutes. 2. In a different large bowl add the flours, brown sugar, baking powder, salt, and cinnamon. Stir with a fork until combined. 3. In the milk and oat bowl, add the eggs and stir until combine. 4. Add the wet mixture with the dry mixture and stir until combined. 5. Heat up a large non-stick pan over medium heat and spray with cooking spray. 6. Using a ladle pour mixture into the pan, wait about 1 minute then add 1 Tbsp chocolate chips. When you see bubbles, flip the pancake and wait until the second side is slightly browned (approximately 2 minutes). You should get 10 pancakes. *Feel free to top with 100% maple syrup for extra deliciousness!